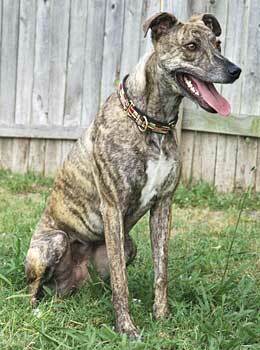 Fran is a lively brindle girl, probably about two years old. The 'milkman' apparently visited Fran's mama, and Fran is a greyhound mix. She originally joined GALT as a puppy in January 2005 after being turned into the Keene Shelter as a part of a cruelty case. Fran, along with several other dogs, was found in a rural area, confined in a small pet carrier in the cold weather - with ice on top of her carrier. It is estimated she was without food and water and living in her waste for about a week. 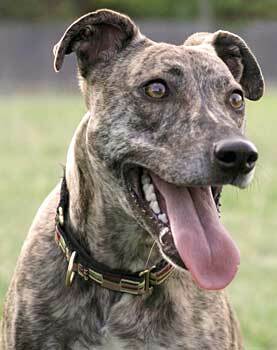 Obviously, Fran was thought to be a full greyhound puppy at that early age, so there was no question about accepting her. 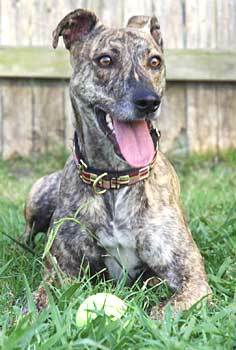 Fran is a prime example of the forgiving spirit of a dog, as she is one very friendly and outgoing girl. She was adopted and recently returned because she did not get along with her family's other dog. Fran's house manners are excellent and she does very well in her crate. Of course you will need to learn her "signal" to go out once she is moved to a new environment. She's a very typical young dog - loves to be with you and loves to play with toys. Given the chance, she will cuddle on the sofa with you as long as you will let her. A good obedience class (also good for bonding) will help this young girl understand what you want from her. She enjoys going for walks and with a little training, will respect the leash. She's not a submissive girl; on the contrary, she's fun loving, very "wiggly" and outgoing. Fran is definitely a people dog – she loves humans! Her tail seems to be the "milkman" part of Fran - it never stops wagging. But be careful - you'll get slapped with her tail when she's happy and excited. Fran is in a foster home as a single pet, and she will do best as an only dog. She is not cat tolerant.